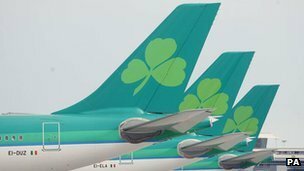 Irish airline Aer Lingus has seen its annual profits more than double, as it continues to benefit from extensive cost-cutting. The carrier made a pre-tax profit of 84.4m euros ($113m; £72m) in 2011, up from 27.2m euros a year earlier. Its revenues rose 6% to 1.3bn euros, while its average income per passenger increased by 4.8% to 112.27 euros. Aer Lingus said the results demonstrated “the success of the changes we have made to our business”. Christoph Mueller, Aer Lingus’ chief executive, added that the increased profits had been achieved “against a difficult backdrop of non-controllable fuel price inflation, increased airport charges and challenging demand conditions in our primary markets”.